Print or note the registration information displayed or wait to receive the information via e-mail. From the ShowMate CD-ROM, run the Impatica for PowerPoint installer (setupppt.exe) by clicking on the link provided on the ShowMate CD-ROM or download the latest installer. 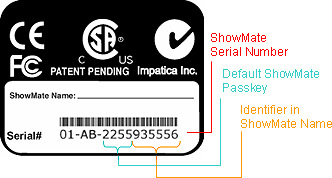 The Impatica Viewer for Sony Ericsson must be installed on your PSony Ericsson handheld before you can load and project presentations. The file is not located on your ShowMate CD-ROM and must be downloaded. Connect your Sony Ericsson handheld to your Windows PC then copy the files ImpaticaViewer.jad and ImpaticaViewer.jar to your handheld (the files are located in the folder "Impatica Viewer" on your ShowMate CD-ROM). On the handheld, navigate to ImpaticaViewer.jad and choose Install. Once the application is installed on your handheld, navigate to it, click the More button to open the Applications menu then choose Permissions. Ensure the permissions for Read User Data and Write User Data are set to Never ask. Copy the impaticized presentation to the handheld or memory stick using Windows Explorer. Use the supplied power charger and USB cable to plug your ShowMate into a power outlet. Once the presentation has finished transferring to the ShowMate, use the presentation menu, shortcut keys, navigation keys or soft keys to control the presentation. Java Platform (JP) 5 or higher with Bluetooth support. Please consult the image below to determine the Java Platform installed on your Sony Ericsson handheld. Java Platform (JP) 3 Symbian or higher with Bluetooth support.